Belfast is the capital and the largest city in Northern Ireland, infamous for The Troubles, a three-decade period from 1968 through 1998 in which there were frequent bomb and gun attacks, with more than 3,600 people killed and thousands more injured. Today, the only real trouble you’ll get into is if you down too much Guinness, whiskey or both in one of the city’s many lively pubs – and, you’ll find lots of awesome things to do, including taking a glimpse at its troubled past. Belfast is renowned for its music scene. If you’ve purchased a home among Houston real estate (or one of many other U.S. cities) you may have several Irish pubs nearby but you’re unlikely to experience anything like what you’ll find in Ireland itself. Here at places like Kelly’s Cellars, one of the oldest pubs in the city, locals bring their own instruments for impromptu jams that can rival some of the best. These quirky tours taken in traditional black cabs will bring you on an intriguing journey through Belfast while listening to tales about the Troubles and other interesting insights about the city from a local driver’s perspective. One of the most unique stays you can have in Belfast can be found at the four-star Europa Hotel, known as the “most bombed hotel in Europe “and even the world, having suffered 28 attacks during the Troubles. It’s also played host to prime ministers, presidents and celebrities. Just like the ship herself, which was built in Belfast, the Titanic Museum is so large one could easily spend two full days exploring it. It features many artifacts from the ship that sank in 1912, including clothing and letters, as well as virtual reality rooms and multi-media displays. The Peace Walls, a series of separation barriers meant to divide predominantly Nationalist Catholic and Republican neighborhoods from Loyalist and Unionist Protestant neighborhoods are a bizarre yet fascinating part of the city. While the bombs and guns have been silenced for two decades, the barriers remain, for now – they’re expected to come down in 2023. Belfast Castle sits atop Cave Hill, making it a perfect spot for views over the city and Belfast Lough. Just north of the castle, this park features a series of basalt cliffs with caves that were used as bomb shelters during World War II. There are all sorts of fascinating archeological sites to visit here – and you can check out the basalt outcrop that’s believed to have inspired Jonathan Swift’s Gulliver’s Travels, known as Napoleon’s Nose. The hit HBO series “Game of Thrones” is shot here in Belfast at Titanic Studios, with many of its other filming locations nearby, including The Dark Hedges and Winterfell. Multiple tours are available for exploring them, departing from central Belfast. Historic George’s Market was built in the late 19th-century and features an impressive array of local, regional and specialty foods as well as local arts and crafts and live music. 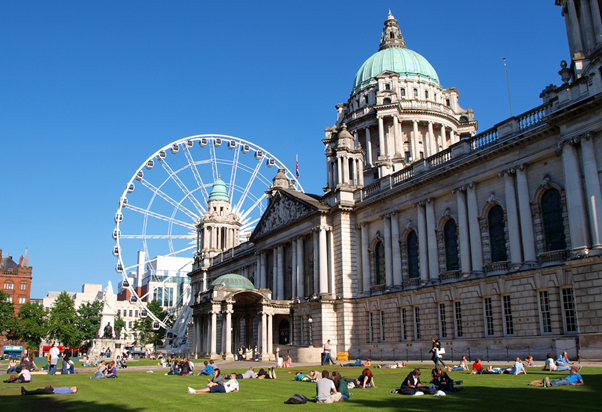 Belfast City Hall is a magnificent Edwardian building located in the center of the city, well-worth capturing a photo of – guided tours are available as well. While it might sound strange, a tour of the Crumlin Road Gaol, or jail, provides another interesting though grisly look at the city’s history and the Troubles. On a sunny day, Belfast Botanic Gardens is one of the best places to be, a popular gathering spot near Queen’s University for students, locals, and visitors alike. Right next to the botanic gardens, the Ulster Museum offers everything from dinosaur bones to impressive works of art and an Egyptian mummy. Northern Ireland’s premier theater hosts concerts, musicals, dance performances, dramas and plays in a spectacular building that opened its doors in the late 19th-century. Belfast Zoo is home to 130 different animal species, including all the favorites, like lions, tigers, elephants and lots of primates from howler monkeys to gorillas. This entry was posted in General Tips Article. Bookmark the permalink.